Born 1976. After several years of employment in a bank, studied art history and philosophy at the Universities of Kassel and Bonn. From 2006 to 2008, academic assistant at the Hamburger Kunsthalle. 2009, doctoral thesis on “Gustav Pauli and the Hamburger Kunsthalle”. 2008 to 2010, academic trainee at the Museum Giersch, Frankfurt am Main; subsequently academic assistant. 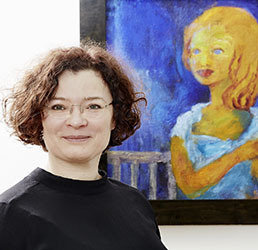 2011 to 2013, Deputy Director of the Nolde Foundation Seebüll. 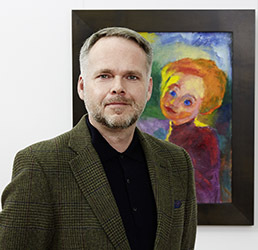 Since September 21, 2013, Director of the Ada and Emil Nolde Foundation Seebüll. Born 1971. Studied art history, classical archaeology and history in Cologne and Berlin. 2006, doctoral thesis in Cologne on “Max Beckmann. Self- and world-image in the themes of coffee house and dance”. 1999 to 2008, traineeship and exhibition assistant at the ALTANA Kulturstiftung, Bad Homburg. 2009 to 2011, academic assistant at the Mathildenhöhe Institute, Darmstadt. 2012 to 2014, academic assistant at the Kunsthalle Bremen. Exhibitions and publications on the Expressionist Gesamtkunstwerk, and on Friedensreich Hundertwasser, Walter Moroder, Gabriele Münter and Pablo Picasso. Since March 1, 2014, Deputy Director of the Ada and Emil Nolde Foundation Seebüll.